Sharon Sanchez is the first player to cash in a @WSOP Circuit event at @TVPokerRoom. 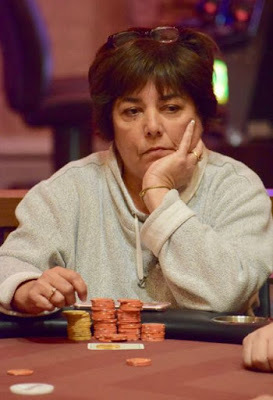 Sanchez finishes 12th today in Event 2 - $365 Turbo - when her AT does not hold all-in preflop against AQ. She earns the $696 mincash, earns points toward the Casino Champion title and also has a bag to open Sunday at 11am for Day 2 of Event 1. There was another elimination as I wrote this up, so off to the unofficial final table they go. We'll be back at 9am with full results from Event 2.